Meghalay Day celebration. ST photo. 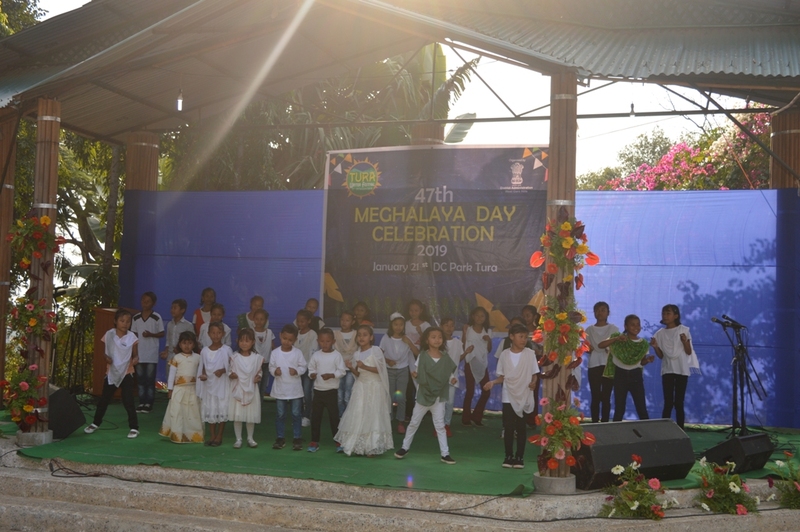 TURA: Along with the rest of the state, the 47th Meghalaya Day was celebrated all across Garo Hills on Monday in functions held in different venues at all the five districts. In Tura, the occasion was celebrated at DC Park where West Garo Hills Deputy Commissioner, Ram Singh graced the occasion as Chief Guest. The function was organized by District Administration, West Garo Hills, Tura. The celebration was kicked off with the Cleaning Drive of the office campuses in the district. Speaking on the occasion, Ram Singh recalled the history of the formation of the state of Meghalaya from the erstwhile undivided Assam and added that the qualities of those visionary leaders should be imbibed by the present day generation. With the attainment of Statehood, peoples’ aspirations have been fulfilled and till today numerous developmental projects have been instituted with the creation of 11 new districts, blocks, etc which aims to bring administration closer to the people of the region. He also urged all the district employees to do justice and deliver their services to the public in good faith and devotion. Stating that the State is blessed with stunning landscape and scenic beauty he advised the people of the region to protect and preserve the environment by keeping their surroundings clean and green and to avoid littering especially plastics bottles, etc and work towards protecting the fragile environment for our future generation. During the function, Gloria R Marak was Awarded in recognition for Social Service, Women Empowerment and SHG Mobilization while Dr Vidyanisth Marak was also Awarded in recognition for Social Service and Protection and Promotion of Traditional Medicine. Superintendent of Police, West Garo Hills, Dr M G R Kumar, EAC, West Garo Hills, Dimse A Sangma, EAC, West Garo Hills, T R Marak, EACs, President, Nokma Council and Retired IGP Skylance G Momin, Chairman, Tura Municipal Board, J D Sangma, Heads of line departments, officials of the district, distinguished awardees, teachers and students of various schools were amongst others present at the function. At Ampati in South West Garo Hills the occasion was celebrated in a befitting manner where Cultural dances, a prayer song for the state and its people and cutting of Meghalaya Day cake marked the official celebration at Ampati Multi-Facility Centre. The celebration was attended by the district officers, senior citizens, government employees, teachers and students. In his address as the chief guest, South West Garo Hills Deputy Commissioner Ramkumar S, referred to the “Meghalayan Age” a term coined by Geologists last year to describe the last age of Holocene which began 4,200 years ago during a worldwide mega-drought as the key data for the timing of the new age was derived from a stalagmite in a cave in Meghalaya. While stating that in terms of nomenclature it is of great significance for the State, he however said that in order to truly define Meghalayan Age in terms of progress and development the people of the State should be innovative and open to new ideas while maintaining unity in diversity. “As we celebrate and commemorate the dreams of our leaders whose peaceful and consistent struggle led to the achievement of our statehood, we should rededicate ourselves to work 10 times harder with a focus on small developments, we should be able to expose our culture to the rest of the world and fulfil the aspirations of our new generations and this should define Meghalaya Age”, he added. Other speakers on the occasion also paid rich tributes to the leaders of Hill State Movement and recalled Meghalaya’s tryst with destiny 47 years ago. Additional Deputy Commissioners S K Marak, S C Laloo and Z J Sangma and one of the senior citizens, E R Marak were among others who also addressed the gathering during the celebration. All government buildings in and around Ampati were illuminated for the occasion. In Williamnagar, the occasion was observed at the DRDA Conference Hall with the theme ‘Clean East Garo Hills’ where local MLA Marcuise N Marak was the Chief Guest while GHADC Chairman Denang T Sangma was the Guest of Honour. During the programme, awards were presented to the best performers from among the staff of the DC’s office by the Chief Guest and Deputy Commissioner of the district Swapnil Tembe. Baghmara in South Garo Hills too observed the 47th Meghalaya Day at the DRDA Conference Hall. South Garo Hills Deputy Commissioner, H B Marak was the Chief Guest on the day. In North Garo Hills, the occasion was observed at the Resubelpara Mini Stadium where Home Miister James K Sangma participated as the Chief Guest. Speaking as the Chief Guest on the occasion, the Home Minister recalled the sacrifices of the freedom fighters who enabled Meghalaya to achieve statehood without bloodshed and urged and all to follow in their footsteps. On the occasion, various items like Wheelchairs, hearing aids etc were distributed to the physically challenged from the region. The Chief Guest also handed over prizes to the winners of a running race organized on the occasion, as well as to the most successful farmers from the area.